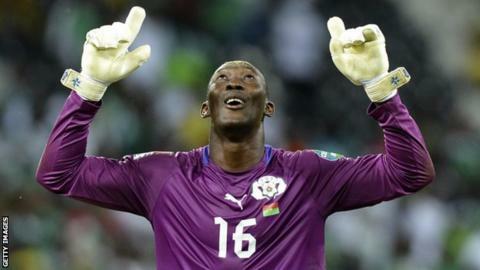 African football is mourning the death of former Burkina Faso goalkeeper Soulama Abdoulaye who died from a long illness in hospital in Bobo-Dioulasso aged 37. Soulama won 42 caps for his country and played twice as the Stallions finished runners-up at the 2013 Africa Cup of Nations. His last professional club - Accra Hearts of Oak - led the tributes, announcing plans to observe a minute's silence before their Ghanaian FA Cup final against Asante Kotoko on Sunday. "We are shocked to learn of the passing of our former goalkeeper Soulama Abdoulaye. We extend our deepest commiserations to his family," Hearts announced. Rivals Asante Kotoko of Kumasi, for whom Abdoulaye also played, expressed their condolences. "We are saddened to confirm the passing of Soulama Abdoulaye. Our thoughts and prayers go out to the family and the Porcupine fraternity," Kotoko tweeted. Some of Burkina Faso's top stars and notable Africans have also been playing tribute to the veteran goalkeeper. "You were the best goalkeeper in Burkina," said Stallions international Mohammed Koffi. "You were a big brother and a team-mate...RIP Abdoulaye Soulama," Koffi added. Ghana international goalkeeper Razak Brimah spoke of his shock at hearing the news of Soulama's death. "It's sad news. Africa has lost a great goalkeeper. Allah knows. Rest in peace Soulama," said Brimah. Former Ghana defender Anthony Baffoe, who is a leading member of the FifPro African body, described the goalkeeper as a "great guy with leadership qualities." "What sad news, he was a leader, very outspoken," said Baffoe. "He was a talented goalkeeper and our condolences to his family." Soulama began his international career at 19 as Burkina Faso's third goalkeeper at the 1998 Africa Cup of Nations tournament on home soil. He started as first choice during the 2013 tournament in South Africa but he was sent off against Ethiopia in the second group game. His club career started at home with Comoé Sports Union (USCO), then Bobo-Dioulasso Sports Association (ASFB) and the ASFA Yennega. He has also played in Algeria (CA Batna) and Turkey (Denizlispor).